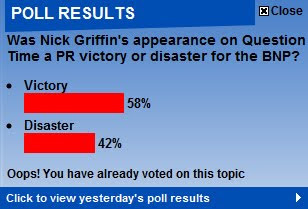 24 hours on and the consensus view that Nick Griffin's appearance on Questiontime was a disaster seems to have crumbled. This is the current state of the poll on the Daily Mail's website and YouGov are saying that 22% of people 'would seriously consider' voting BNP. I think it illustates how out-of-step so many politicians and media commentators are, and in turn, why they are so led by opinion polls and focus groups (they have to be - they just don't have a grasp on how people feel). How have we arrived at a point where someone who is clearly associated with racism can be 'seriously considered' by 22% of the electorate? I bet if the question had been 'possibly consider', the result would have been a lot higher. I blame a lot of this on the current Labour government. Back at the 2005 election Michael Howard made immigration an election issue. In another act of signature political cynicism Labour responded by associating immigration with racism. In other words, they attacked Howard's policy as being racist. It worked, because it played to many people's uncertainties about the Conservative party and it suppressed many of those people (like anyone working in the Building trade for example!) who thought uncontrolled immigration was a problem by telling them that to oppose immigration would be racist. But the legacy of that tangled web was that the association between immigration and racism stuck fast and has persisted long after the election. Another one of those 'unintended consequences'! So in the following years, when Labour finally realised that their 'open-door' policy to immigration was having intolerable consequences and they reversed their position and became anti-immigration, they implicitly (not actually) favoured racism. The implication was clear. Previously controlled immigration meant racism and this was bad. Then suddenly, controlled immigration was good so surely racism must be, if not good, then at least acceptable.. see the logic. Put it another way, the stigma of racism, or being racist, was perceptibly lifted. It became, to an extent, socially acceptable to be a bit racist. After all, if the government are shamelessly a bit racist, then why shouldn't anyone else be..
(If you are reading this and feel sceptical about it then just ask yourself why global brands pay mega-stars like David Beckham millions to associate their brands or products with them - association is a hugely powerful tool for changing people's perceptions and making something much more desirable - or much less desirable). But Labour didn't stop here. When fighting 'The War Against Terror' Labour repeatedly confused terrorists with Muslims. One particularly memorable occasion was when Jack (man of) Straw sat in the same Questiontime seat as he did on Thursday and said that any Muslim woman who walked into one of his constituency surgeries should remove her hijab. (I nearly fell off my chair!). He went on to say that he couldn't communicate properly if she didn't. Poor old Jack must find the telephone terribly limiting. So the 'support' for Griffin (or perhaps the lack of widespread vilification) is the consequence of a cat that was let out of the bag some time ago. I think the only answer, and the only way to turn the tide, is to go back to the basic arguments and win the argument about why any kind of prejudice against minorities is wrong. How to do that? The subject of another post I think. Tim Dodds (Black Belt 3rd Dan Master Blogger of Lightwater) tells me my posts are getting too long. He is probably right.